Broomfield, Colorado, USA, May 23, 2017 – Innovyze, a leading global innovator of business analytics software and technologies for smart wet infrastructure, today announced that Dr. Qian Zhang, Research Scientist with the University of Maryland Center for Environmental Science at the USEPA Chesapeake Bay Program, has been chosen to receive the American Academy of Environmental Engineers and Scientists (AAEES) 2017 Innovyze Excellence in Computational Hydraulics/Hydrology Award. This prestigious annual award recognizes a student whose research contributes to the knowledge pool in Computational Hydraulics & Hydrology. Selection is based on original, innovative research of publishable quality and other factors. Both Master’s and Ph.D. students are eligible. How to approximate the Flood polygon created in InfoSWMM RAM by using Arc Toolbox and Subcatchment Manager Tools Step 1 – Run InfoSWMM and use Map Display to show the Maximum HGL. This is just for reference to the later created polygons. Step 2 – not needed but as a check to Steps 3 to 5. 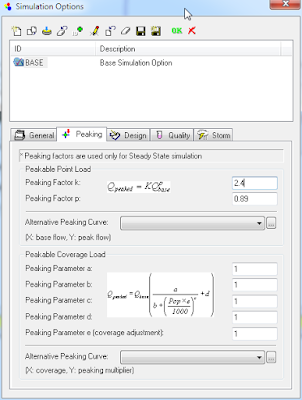 Use InfoSWMM RAM to show the area flooding based on the Maximum head or HGL. This is an approximation of the flooding you would show with have with InfoSWMM 2D. The maximum HGL is intersected with the DEM or TIN and the DEM elevations below the Maximum HGL are shown in Blue. A great feature of SWMM5 is the ability to use batch files to call the Console engine of SWMM5 or SWMM5.EXE. This is used by many students and professionals for Monte Carlo and other analysis. 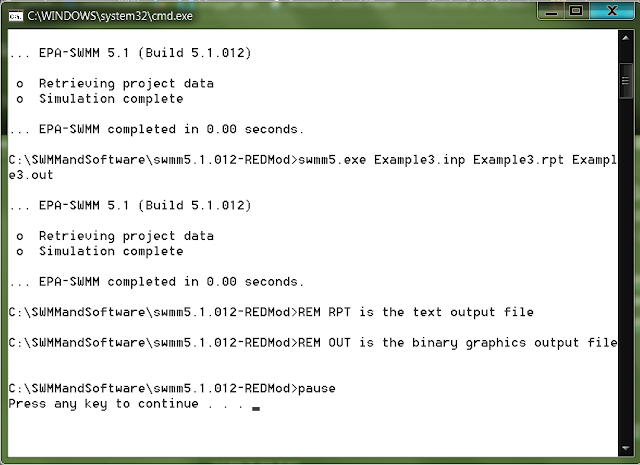 Here is a sample batch file and Figure 1 shows the screen output.